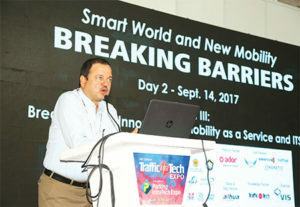 Opening the session ‘Mobility as a Service’ at the Conference during TrafficInfraTech and Parking InfraTech Expo 2017 in Hyderabad Abhay Damle, Joint Secretary (Transport), Ministry of Road Transport and Highways stressed on the need for shared mobility and public mobility reforms and to reduce our dependence on private ownership of the vehicles. A study conducted in 2013 on Vadodara-Mumbai sector, out of the 100 passengers travelling, 65 took buses and 35 travelled by cars. In 2017, 100 had become 130 and out of this 130, 67 travelled by bus and 63 travelled by car. So, within a matter of probably three and a half years to four years what we have seen is that the number of passengers travelling by bus rose by 3%, and by cars by 80%. We make our highways from the perspective of passenger car units. If we continue to see this kind of growth in the movement of private cars, we will be making one additional lane every three years. And probably to make an additional lane, it takes about three years, so we will be continuously making the lanes and widening the roads; it would be a never-ending process. Moreover, it is not very easy to find land for road widening. Even if you find land for road widening, it requires a lot of financing, funding to manage that particular capacity creation. If you require that kind of funding for the roads, probably the other areas where the development is really required would take a back seat. On the other hand, if we take the Railways, the tracks have not really been increased so much in the last fifty years. Still, the number of trains carrying passengers and freight or the overall passenger and freight carrying capacity of the railways has increased multi-fold. This has happened because of the improved utilisation of the railways by improving the speeds, by increasing the number of bogies or the coaches in the trains and making an efficient utilisation of the overall track. Something similar should be done on roads. How do we make a more efficient utilisation of our roads? Naturally, we need to carry more passengers per square feet of the road. In a city like Delhi, there are 30 lakh cars. A car takes about 8X6 feet, that is fortyeight or fifty square feet to be parked. If you look at 30 lakh cars, all of them require 50sqft minimum area plus another 25sqft square feet for parking. We must see how we make use of our land diligently. One another study has shown that the utilization of personal car is about three percent. When we use the same car for shared mobility platform, that is for taxis and others, the utilization increases depending upon the number of drivers you are able to use; with one driver, it increases to almost 40 to 50 percent, with two drivers, it may go up to 80 percent. That is the kind of utilization we can achieve from a single asset. Most of us look at taxi as a costly solution compared to car because none of us probably think of car as a capital expenditure since it is mostly a personal expenditure having been incurred one time whether through loans or otherwise. We do not consider that expenditure as one of the major issues but if you consider that expenditure and if you consider the total operational cost of your personal vehicle, your cost of running the personal car including capital cost plus the notional interest will not be less than Rs 35 to 40 a kilometre. That is the kind of costing you arrive at when you are using your personal cars. 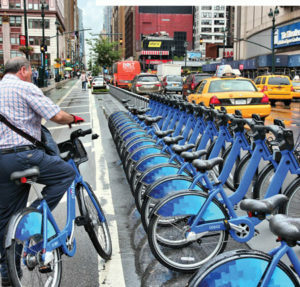 A shared mobility vehicle is being used for about 200 to 300km a day. It is leading to employment of at least two persons. The cost may be between Rs 10 to 20 per kilometre. Again, there will be lesser congestion on roads and all kinds of related benefits. But what are the reasons for the shared mobility concept not taking off in the smaller cities? The first barrier to be broken is probably the mindset, which will change provided we give good facilities. There is an ecosystem which provides for very good facilitation of the public transport services. If one gets a good bus, one will be able to leave the car and board the bus. Again, a cordial taxi driver encourages to take a taxi again. Our mindset towards the taxi driver and the taxi drivers’ mindset towards us are changing. There is a very good system brought in by the fleet companies for anonymous ratings. The drivers should also know that they would get better payment, better incentives if they provide better services.